Built on a history of success in the elementary physical education market, cosom by CRAMER is the brand requested by educators and retailers who demand the very best for students and recreational athletes. two of the most respected companies in the sporting goods industry, CRAMER products and cosom sporting goods joined Forces to offer the highest quality physical education and sports training products and together offer better service and more choices than ever before. from scooter boards to Hockey to fun balls, cosom by CRAMER is the most trusted brand in the industry for fun, recreation and learning. Durable plastic shaft and head with foam grips. Solid foam balls roll well on hard and soft surfaces. Three plastic "holes" allow for multiple targets, team play and developing golf and color recognition skills. 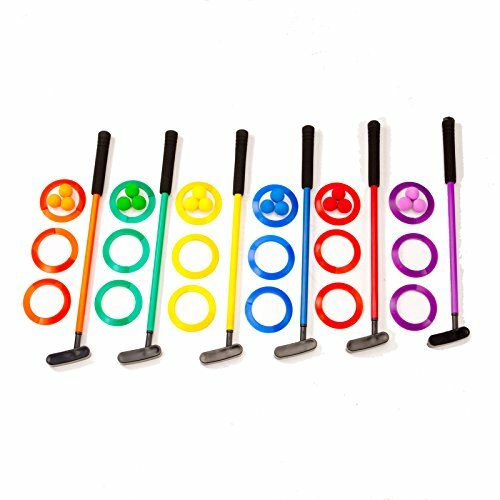 Set contains six 24" putters, 18 targets and 18 foam balls all in 6 colors: Blue, Green, Orange, Purple, Red and Yellow.